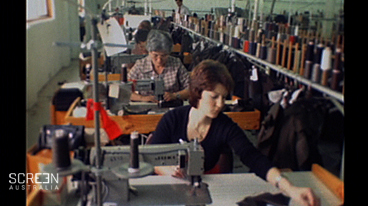 Video clip synopsis – As the door on imports widened at a rapid rate in the 1980s, the Fletcher Jones clothing business struggled to remain competitive. But the company and staff were determined to have a go and keep the factories busy. Broadband MP4 fletcher_bb.mp4 (11.9MB), suitable for iPods and computer downloads. Fletcher Jones is an excerpt from the documentary Fabric of a Dream, The – The Fletcher Jones Story (52 mins) produced in 2004. This is the story of how a shellshocked World War One veteran, who’d left school at 12, ended up creating a national icon. An inspiring man with bold and imaginative ideas, Fletcher Jones was influenced by Japanese reformer Toyohiko Kagawa, one of the most remarkable social activists of his time. Jones established his clothing design, retail and manufacturing business with an emphasis on quality, service and innovation. But his primary concern was for people – both his customers and his workers – and they, in turn, were intensely loyal. This is a celebration of the man and his dream – of a model working environment based on values other than simple profit – set against the backdrop of 20th century history. A Film Australia National Interest Program in association with Melodrama Pictures. Produced with the assistance of Film Victoria and in association with SBS Independent. The history of Fletcher Jones and his clothing business is a microcosm of what has happened in the steel industry and the car industry, right across the textile, clothing and footwear industries and on farms. It is a story that is imminently transferable in the contemporary Australian historical and political context. In the climate of Government protection of domestic industry Fletcher Jones became a household name. This documentary celebrates the life of an inspiring man with bold and imaginative ideas; the founder of one of the most successful clothing companies in the nation’s history. He was an inspirational man who believed in sharing his success with everyone who helped to create it; a businessman who put people before profits and still prospered. His company, Fletcher Jones and Staff, followed a groundbreaking business model and thrived. The story’s context is 20th century Australian history: the aftermath of war, the challenge of global capitalism, the impact of immigration and the rise and fall of modern industry. Note what is meant by ‘protection’ for industry. Note why ‘protection’ was lifted in 1973? Note how Fletcher Jones & Staff were affected by previous policy. Note details of ‘populate or perish’? Context? Implications? Results? Note why ‘this’ had to change by the 1970s? Note results by 1979? Note how Fletcher Jones &Staff responded to the new conditions. Note why Fletcher Jones & Staff could not compete with overseas products. Note the dilemma faced by Fletcher Jones & Staff. What is meant by globalisation? Implications? Which Prime Minister introduced ‘free trade’? What was the intention of this ‘tariff’ reform? How was this policy change greeted at the time? What impact has this policy had on Australian manufacturing industries? What impact has this policy had on Australia’s economy generally? Note other reforms introduced by this government. Do these reflect the impact of globalisation? How was this Prime Minister and government treated by the electorate? Write a report on the impact of government policy on Fletcher Jones & Staff. Draw a concept map of the reforms of the Whitlam government. For discussion: To what extent were the reforms of the Whitlam government a response to globalisation?